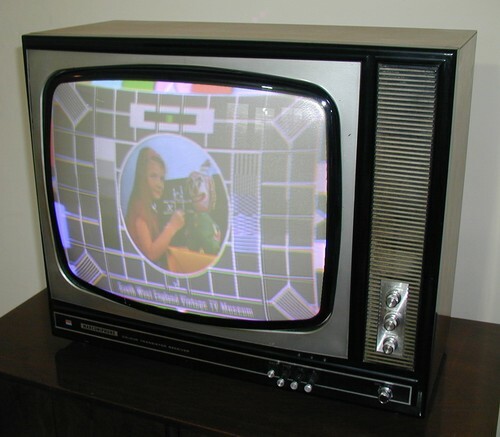 This first TV on page 3 of the gallery is a 1971 Bang and Olufsen model 2600. This has a very similar chassis to Bang and Olufsen's older 25-inch model 3000. It is a hybrid design with solid state devices for the low power sections and a somewhat peculiar mixture of valves for the high power stages. 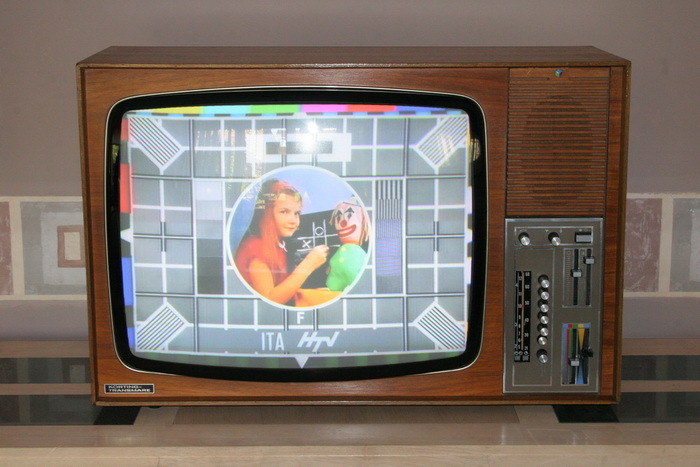 I think it is probably the last design of colour TV that still used a GY501 EHT rectifier. The next set is a Bush CTV25. 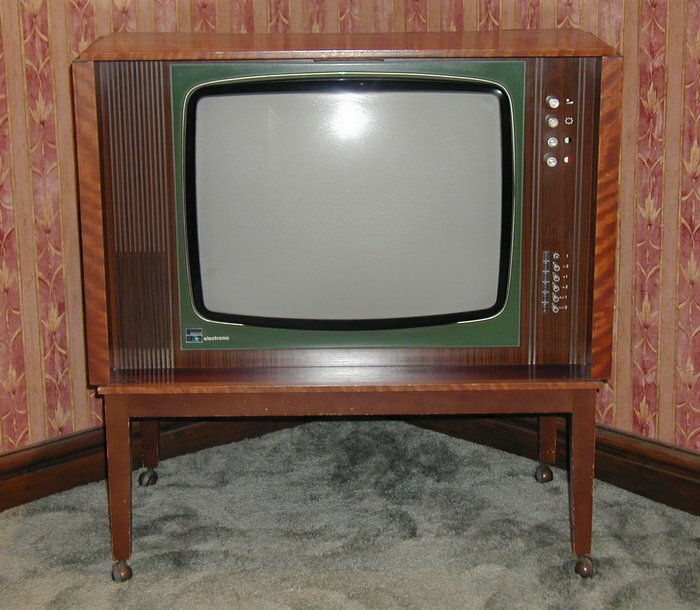 This set is virtually identical (even in its cabinet) to the Murphy CV2510 on page 1 of the Colour TV Gallery. This particular set was pretty much complete when I collected it, although I have no legs for it which is a bit of a shame. Does anyone have any spare legs for a Bush CTV25 (or a Bush CTV167)? This TV is a Bush CTV167. It was the slightly cheaper cut-down version of the Bush CTV25 (above). The chassis inside the set is identical to that of the CTV25, it was just the cabinet which was less elaborate. When I dig the TV out from where it's currently living, I'll take a few better photos of it. 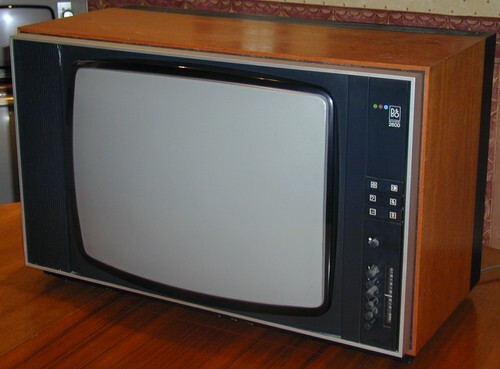 The next TV is a single standard Bush CTV1120. This 20" colour set was given to me a very kind chap called Sid from Solihull. Initially I thought the tripler was faulty too and I was kindly sent one by an excellent chap from Birmingham. However, on closer inspection, it was just the wire from the tripler to the line output transformer that had become detached. Doh. This set is pretty much the same as the Murphy CV2011 on page 2 of the CTV gallery. 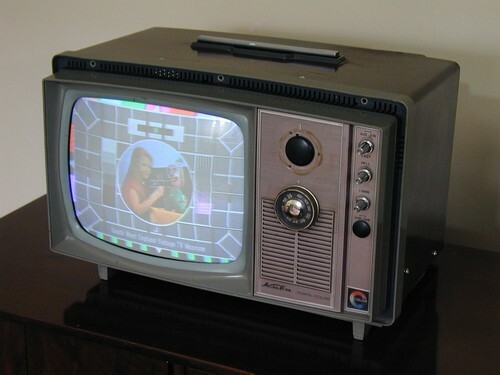 This next TV is a Decca CS2230 from 1973. These sets were very popular and relatively reliable so a lot of them still turn up. This set uses the Decca "30" chassis, which was really just a development of the older "Bradford" hybrid chassis. Sets that used this basic chassis came in lots of different sizes including 17-inch, 19-inch, 20-inch, 22-inch and 26-inch. The next set is a 1973 Ekco CT122 and uses the common Pye 697 hybrid chassis. The Radio and Television Servicing book from 1972/1973 says this should use a 693 chassis, but maybe later versions were changed from the old metal-box type line stage of the 693 to the newer printed-circuit kind of the 697. This TV actually has doors, although you can't really see them in the picture. I was very kindly given this set by an excellent chap called John from Ottery-St-Mary in Devon. Thanks John - I'll start work on it one of these days. No, really. This TV is an Invicta CT7050. It came from an excellent chap called Graham from Cambridgeshire. Thanks Graham. 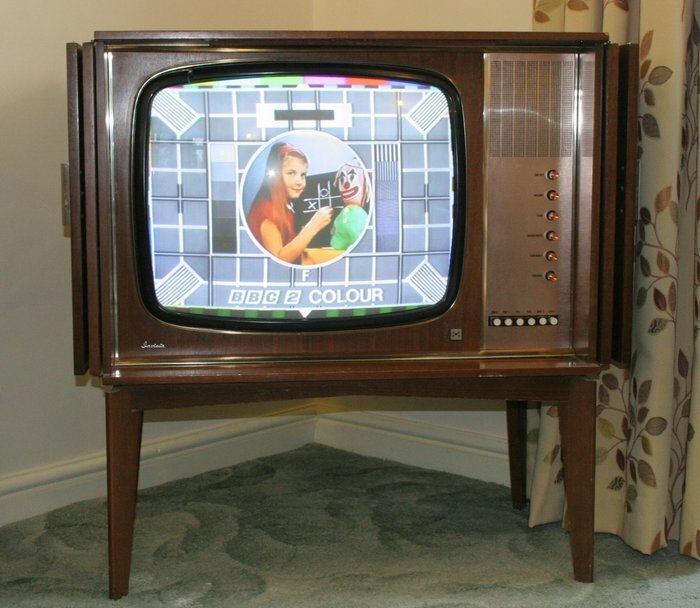 The set uses the original dual standard "Pye Colour Chassis" (Pye never gave the chassis a name). After a bit of a struggle with one problem and another, the set now displays a spectacularly good picture on both 625 lines and 405 lines and is one of my very favourite sets. 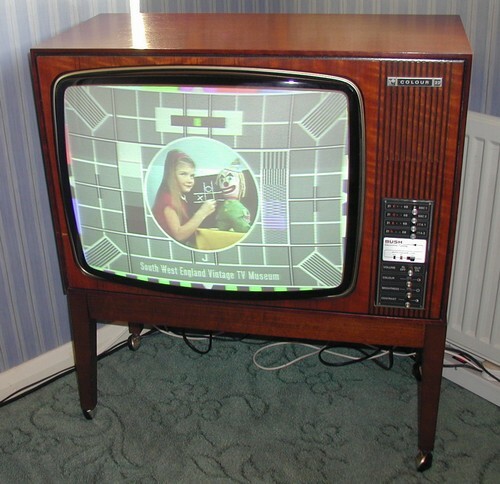 The next TV was given to me by a very nice chap from Bletchley (Near Bletchley Park - The code breaking place). It's an ITT CK651 and uses the ITT CVC9 chassis. From what I can gather, this chassis and it's slightly older cousins were universally liked in the trade. They were easy to work on (except, notably, the IF stage), reliable, and always gave a cracking picture. The tubes seemed to last forever too. When I first had this set, it was a bit grimey and it looked a bit sorry for itself; half an hour later with a can of foam-cleaner however and it looked like new! There were a couple of faults with it - a frame fault, which was cured by my mate Rob Ingleby who now lives somewhere in Hampshire I believe, and a second fault which was simply the Red output transistor, a BF337. It still needs a new PCL805 as the frame stage takes a while to come to life, but unfortunately I am always short of PCL85s / PCL805s. The TV picture looks a little bit wobbly in the image below because it's being fed from a cheap-and-nasty modulator which has this line-tearing and cogging effect on a lot of old TVs. 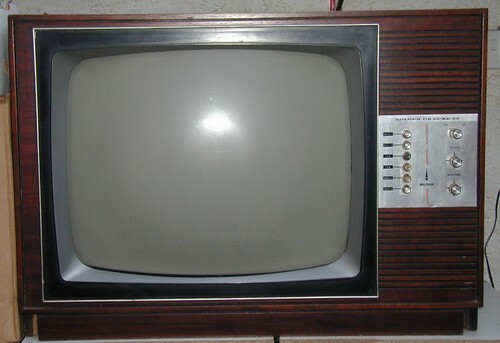 This next TV is a Korting "Transmare" model 54660 from 1974. It's a hybrid set with a fairly conventional line up of valves for the high power circuits, with transistors etc. used for the lower power sections. 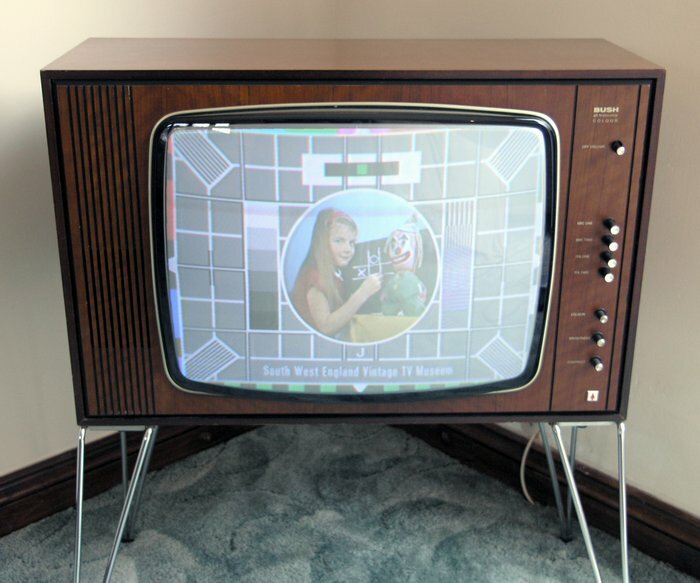 I'm not really sure what to say about this TV as I have no idea where it came from, I've no real experience of this model and I've not started any restoration on this particular set. 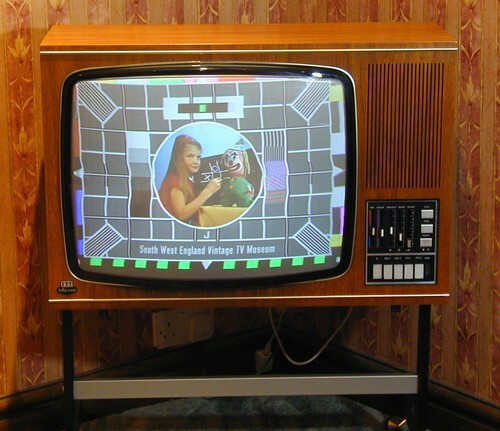 I did have a similar set many years ago which always had a cracking picture, and our neighbour in Exmouth rented a "Baird" badged version from Radio-Rentals in the late 1970s. 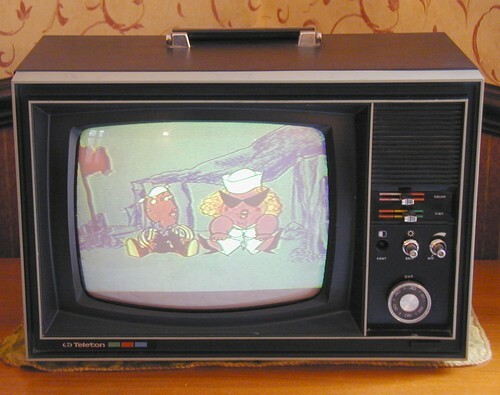 This TV is another Kuba Portacolor from the early 1970s. These sets are the kind that I really love but I also really hate. I love them because they are so quirky and odd, with their weird CRT and weird valve line-up, the unused VHF tuner not-very-subtley hidden away behind a metal plate, and their general strangeness; I hate them because of their nasty-horrible plastic case that breaks way too easily and their absurdly awkward construction that makes servicing difficult. They use the simple-PAL system to decode the colour, but because of the fuzzy low definition tube, you never really notice the Hanover blind effect anyway. This set came from a great chap called Simon from Chipping Norton. Thanks Simon - It's an ace TV. This next set is a 19-inch Marconiphone 4703 and came from a very nice old chap from Birmingham. It has the most amazingly deep scratch in the front of the tube at the bottom left, but I don't think it's terribly significant given the thickness of the glass over all. The picture below shows the set as it was just after I had collected it. The tube looks reasonable (although not wonderful) and the convergence is all over the place - Other than that it seems pretty much okay. I'll take a photo of it again once I've sorted out the convergence and anything else that may need fixing. The set uses the very common Thorn 3000 solid-state single-standard chassis. 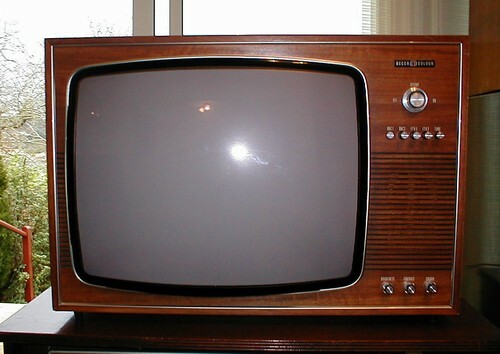 The next TV is a 1974 Philips G22K550 and uses the later version of the solid-state G8 chassis. This set came from an excellent bloke called Steve from Peterborough and it needed virtually nothing doing to it other than a few minor tweaks here and there. It produces a cracking picture, certainly one of the best pictures I have seen on a Philips G8. This set is a 16" portable Sanyo model CTP370 from 1974. It's a portable only in as much as it has a handle and it's relatively small; the part of "Portable" that means "Easily moved" doesn't really apply to this set as it weighs in at a whopping 47 pounds and is a sod to carry around. It has a hybrid chassis using 10 valves including a 3BS2A EHT rectifier. This set came from an excellent chap from Nottingham called Steve James who I haven't seen for years as I lost his phone number when my old mobile phone died. 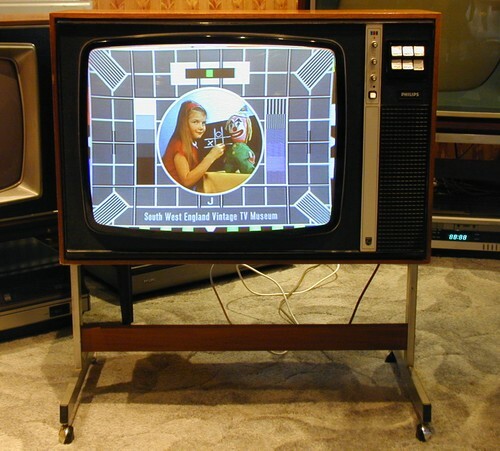 Thanks for the telly Steve, it's a cracking old thing. 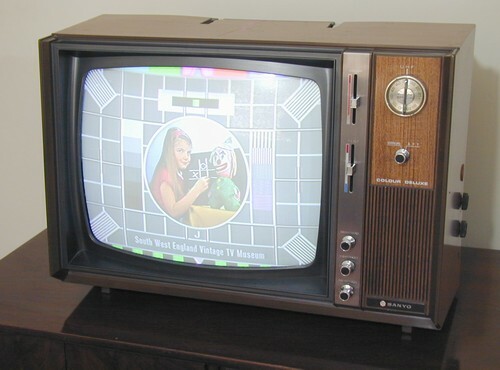 This next set is a 1972 Sony model KV1320. 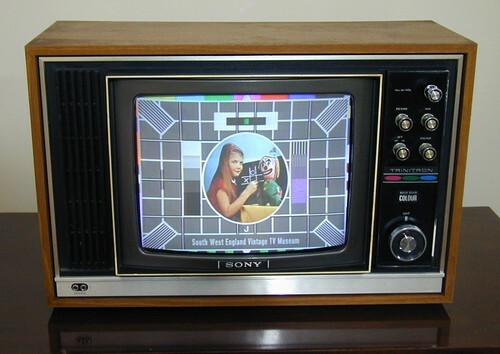 There never seems to be a shortage of these little 13-inch Sony TVs as they were always very reliable, but unfortunately most of them that still turn up have been used to death by their owners and normally have very poor tubes. This set along with the similar KV1300 / KV1310 and KV1330 used a strange method of decoding the PAL signal. The decoder used a 64 microsecond delay line to store every other line, but instead of using the delay line to average out the phase of the current line and the "remembered" line (as with Deluxe PAL), it simply repeats the same line twice. Any phase errors can then be compensated for by using a Tint control on the front of the set. 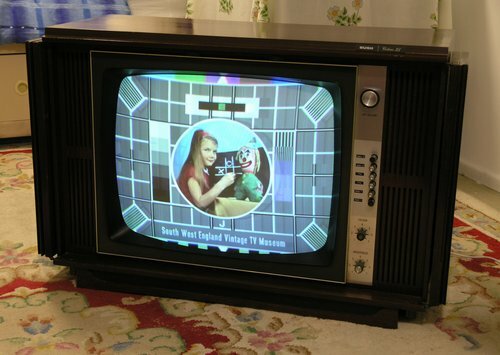 This particular TV came from a rubbish-dump near Solihull and didn't really need an awful lot of work to get it to it's current condition. 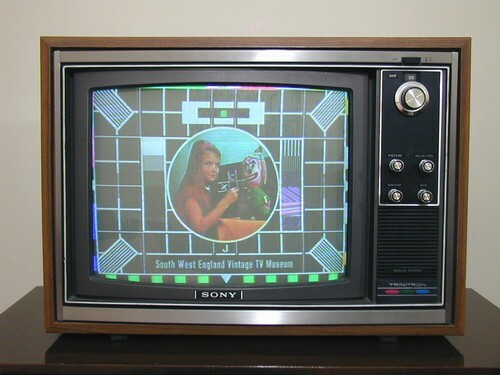 Like the KV1320 above, Sony KV1800s like this next set seem to turn up quite a lot as they were pretty reliable as 1970s colour TVs go. This tube in this one is a little bit tired (as can be seen by the fairly dim picture) but not half as bad as some I've seen. This set came from my mate Steve Farley via another mate called Rob Ingleby. Thanks Steve and Rob. This next set is a Teleton VX1110 portable TV. I was never really a fan of these sets except for a little bit of me which liked them simply for their quirkiness. These and their bigger-brothers used chunky metal cabinets with sticky plastic-wood rolled over the top. They had a really weird valve line up too and some of the valves are quite difficult to get hold of now. Partly because of the simple-PAL system that the sets used to decode the colour and partly because they were just generally rubbish, they always produced a picture which, in my opinion, was mediocre at best. However, I still kinda-like them in spite of (or maybe even because of) their faults.